Pajamas and eggs are two things that go together well just about any day of the week. Jerry Wilkins, president of the Colorado Egg Producers Association and Ian MacClure, the co-owner of Syrup were in the 9NEWS studios to discuss their charity event, PJs & Eggs. The event was in honor of World Egg Day and helped the local charity, Ronald McDonald House Charities of Denver. 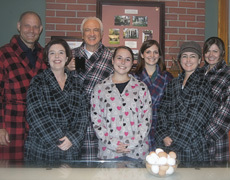 A collection site for news kids pajamas was set up at participating restaurants and attendees were asked to don their pajamas and enjoy “brinner,” or Breakfast-for-Dinner.